An Iowa Learning Farms estimate showed Iowa farmers planted 623,700 total acres of cover crops in 2016, a 32% increase compared to 2015. However, one of the scenarios in the Iowa Nutrient Reduction Strategy says 12.6 million acres of cover crops are needed, in combination with other practices, to help meet the state’s nutrient reduction goals. Cost-share sources continue to be targeted at cover crops. The recent EQIP sign-up provided a cost-share rate of $41.39/acre for winter-hardy single species cover crops. The state recently increased the statewide budget for Water Quality Initiative funding for cover crops which pays $25/acre for people who haven’t tried cover crops before and $15/acre for people who have tried cover crops before with a 160 acre maximum. A single-species, winter-hardy cover crop is estimated to have a total cost of $35-50/acre depending on whether or not you seed/spray yourself or hire the work done. If you haven’t planted cover crops before, you can apply now for state funding, but the funds won’t be available to allocate until after July 5. If you have planted cover crops before, we can add your name to a list of interested people, but you can’t actually apply for funds until the end of July and we likely won’t receive notification about funding until August. The available fund amount will be based on how many “first time users” apply for funding. The 160 acre cap is statewide, not per county, so please make the office staff aware of this if you plan to sign up for funds in multiple counties. If you are receiving cost-share for cover crop through EQIP or CSP, you are not eligible to receive additional funding through state cost-share on those acres. Obviously the available cost-share helps provide financial incentive for planting cover crops, but there are also many additional environmental and economic benefits from cover crops. Erosion protection is one of the biggest reasons why people plant cover crops in NE Iowa. There is economic benefit to reducing erosion and the associated nutrient loss. A study done by Iowa Learning Farms found that $6.06 can be credited to soil conserving methods like cover crops for every ton of soil that is kept in place. Yield can be affected by cover crops. If planter settings aren’t changed to handle the additional residue or if nitrogen isn’t applied at corn planting, some producers have found a yield reduction when using cover crops. However, a study from Practical Farmers of Iowa has shown either no impact on yield or the potential to increase yield, especially in soybeans following a cover crop. There was an average of 5 bu/acre increase in soybean yield on these specific fields. The potential to increase yield by improving soil health and nutrient retention could have a big impact on the profitability of using cover crops. Cover crops can help to suppress winter annual and early season weeds, especially if they are allowed to grow until right around planting in the spring. 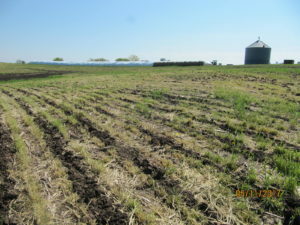 The allelopathy that is sometimes mentioned with rye cover crops has a greater effect on small seeds, like weed seeds, than on larger seeds like corn or soybeans. Depending on the field conditions, you may be able to reduce an herbicide pass, resulting in greater cost savings. Many cover crop species help scavenge nutrients and increase organic matter (over time). Increased organic matter has greater nutrient holding capacity. By adding cover crops to a rotation, you may be able to reduce fertilizer application amounts and fertilizer costs. Keep in mind, however, that nutrients captured by the cover crop will not be immediately available and starter fertilizer should be applied if planting corn. The most difficult aspect of cover crop benefits to put a dollar figure to is improved soil health. Improved soil health can include improved organic matter, infiltration, aggregate stability, water holding capacity, microbial diversity, and reduced erosion and compaction. Organic matter can potentially be increased 0.1% per year if utilizing cover crops with no-till. Cover crops can provide forage for livestock. If you are planting a cover crop with a goal of grazing it in the spring, you will likely want to ensure that it is seeded early and increase your seeding rate to increase the biomass production. By grazing the cover crop, you will be providing feed for the livestock while the pastures are still growing and the animals will return some of the nutrients to the soil through manure. However, compaction may become an issue, so avoid grazing the area when the fields are wet. Many cover crop species can provide at least 1-2 tons of dry matter per acre. If harvesting the cover crop as hay or silage, land rent has already been factored into the cash crop costs and can be omitted from the costs of cover crop harvest, making it more profitable. Harvesting cover crops as forage (grazing, haying, ensiling) will not affect crop insurance as long as the cover crop is fully terminated within 5 days of planting (zone-dependent) and the cover crop is not harvested for grain. Also, cost-share could potentially cover (most of) the seed and establishment costs. More information about utilizing cover crops as forage can be found in the PFI publication Livestock & Cover Crops. There is no easy way to put a dollar figure on cover crop benefits, especially since there are so many variables such as tillage, crop rotation, soil type, slope, and weather that impact cover crop growth. One year of cover crop use is likely to have some benefit, but continued use will have substantially greater benefits. If you have tried cover crops before and haven’t seen much benefit, keep trying. If you have questions about how to make them fit in your rotation, please contact the Allamakee NRCS/SWCD office by stopping by 635 9th St NW in Waukon, calling 563-568-2246 ext.3 or emailing sara.berges@ia.nacdnet.net. Also, please let us know if you want to sign up for state cost-share so we can get you added to our list.